Did you know Mobile, Alabama is the birthplace of Mardi Gras in the US? As the original capital of French Louisiana, Mobile celebrated Mardi Gras 15 years before New Orleans was founded, and 300 years later, the celebration continues! So in honor of our conference city, we are bringing Mardi Gras to CERF! On Sunday, 3 November, we'll kick off our opening social with a Second line Procession, a traditional people's parade with a fascinating multicultural history. As tradition holds, our parade will be led by a local brass band, The Mobile Second Line Society, followed by our CERF attendees! We'll parade through the halls of the Mobile Convention Center, and if you're lucky, you might just catch some beads or a moonpie from some of Mobile's own mystical Mardi Gras krewes! 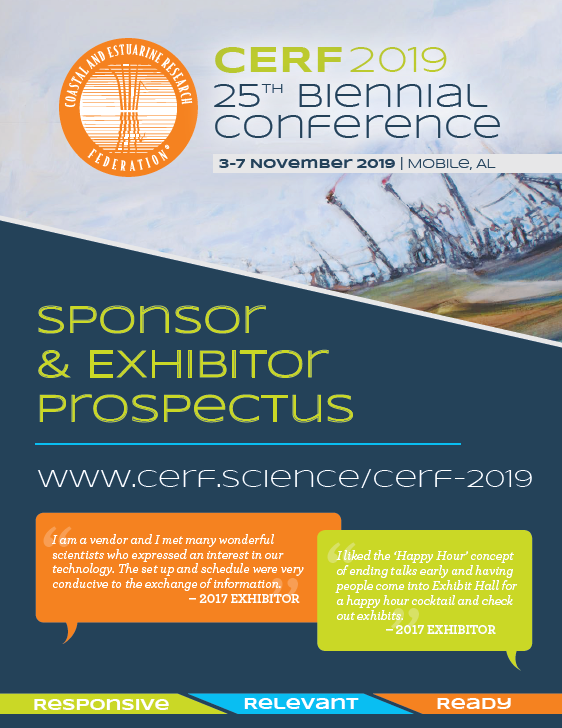 So get ready to "let the good times roll" at CERF 2019, or as the locals say, "Laissez les bons temps rouler!" The CERF Biennial Conference attracts a highly educated crowd. These attendees are often recognized as community leaders and have significant influence and purchasing power in a variety of niche markets. Last year, more than 1,700 attendees came from every state in the U.S. and from 30 countries, bringing a wide range of experience, expertise, and backgrounds to the conference. Your sponsorship message will reach this active and engaged audience, as well as those ranging from students and researches to federal and state agents! We hope you will take a moment to consider sponsoring this exciting educational event alongside other prominent companies. Before you sign up, please take a moment to explore the prospectus and learn about your sponsorship and exhibitor options and opportunities. Due to the high volume of attendees we receive each conference, you may book your room at any of four hotels located near the Mobile Convention Center. Prices vary depending on the hotel, but by staying within the CERF 2019 room block, you'll already be saving significantly!